2011 was a hell of a year for big game releases. I remember at some point in the fall thinking, "Dude, we are approaching 2007 territory here." I remember remarking at one point on Twitter that "2007 was to gaming what 1959 was to jazz." 1959 being the year that Giant Steps, Kind of Blue, Mingus Ah Um and Brubeck's Time Out were released (and hey, as I type this, this cafe is playing "Strange Meadow Lark" from that very album). It was also the year that Ornette Coleman set things on their ear with the free jazz record The Shape of Jazz to Come. This of course gave rise to all manner of debate. What was the 1959 of jazz... of gaming? You know what? Forget 2007. 1998 was a hell of a year for big game releases. In fact, there's a strong case to be made that 1998 was the ultimate year in video gaming. Let's see: Fallout 2. StarCraft. Ocarina of Time. Xenogears. Suikoden II. Thief: The Dark Project. Grim Fandango. Metal Gear Solid. Mother-effin Half-Life. Mother-effin Baldur's Gate. 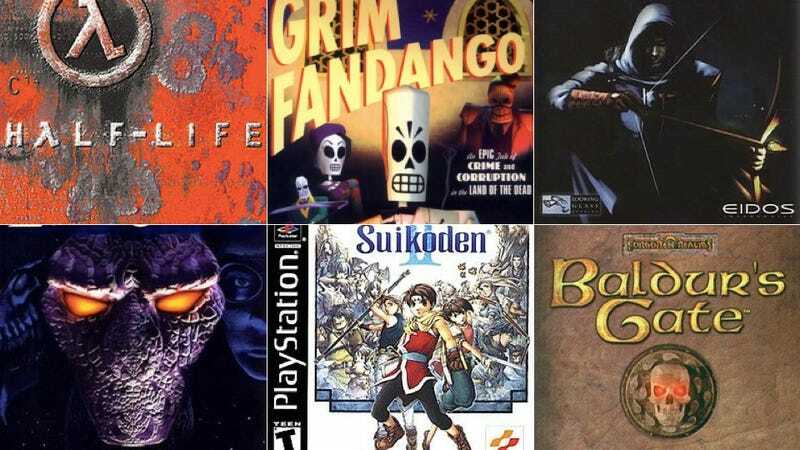 I put it to you, readers: Was 1998 the best year ever in gaming? There are arguments to make for other years? Could there possibly be any contenders to this amazingness? If we get enough alternatives together, maybe we'll do a DEFINITIVE KOTAKU POLL next week.